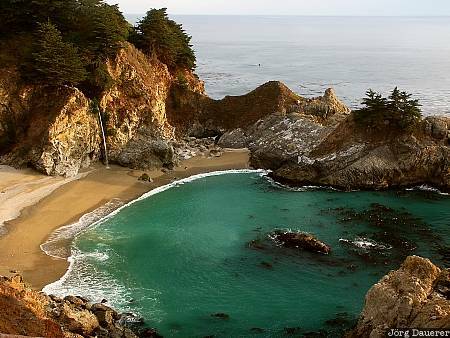 The waterfall "McWay Falls" in Julia Pfeiffer Burns State Park falls onto the beach. Julia Pfeiffer Burns State Park is at the central pacific coast of California, United States. This photo was taken in the afternoon of a foggy day in October 2002. This photo was taken with a digital camera.